Heine Beta 200 Streak Retinoscope 3.5V - Gold Coast Ophthalmic Instruments, Inc.
HEINE Instruments. A Perfect Balance of Everything That Matters. Customers choose HEINE products because they provide what matters most to them. HEINE user’s want long lasting instruments that provide the most accurate and reliable diagnostic information with features that optimize performance in any examining situation. In other words, they want the Durability, Performance and Function that only HEINE instruments offer. 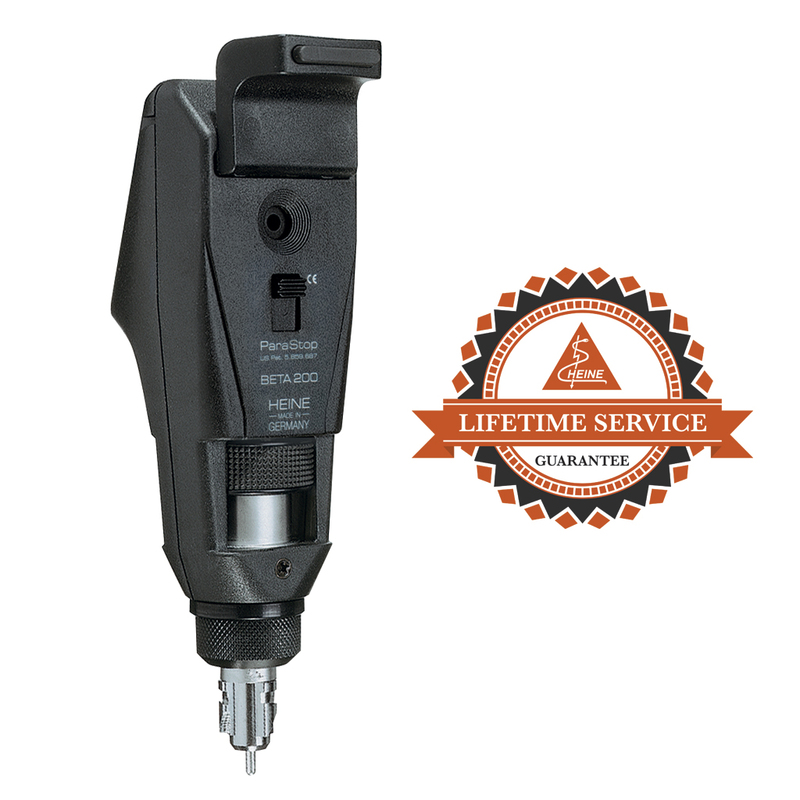 The Best Warranty in the Market: Lifetime service warranty. Never pay for service while you own the BETA 200. Lifetime Dustproof Guarantee: Crisp, clear views for a lifetime. HEINE XHL Xenon Halogen bulb: Provides excellent color rendering and long life. Precision HEINE Optics: Multi-coated HEINE made optics ensure crisp, exceptionally bright reflex. Internal Polarizing Filter: Exclusive positioning eliminates stray light and internal reflections without reducing reflex brightness. Ergonomic Enclosed Vergence Sleeve Design: Comfortable design allows for effective operation of vergence and rotation. Detachable Brow Rest: Increased comfort and control for users who wear glasses. Patented ParaStop Setting: Allows for quick and easy selection of parallel beam which simplifies the verification of cylinder axis. Streak or Spot: Convert to spot by changing the bulb (X-002.88.090 Spot bulb). Fixation Cards: Optional fixation cards and holder available (C-000.15.360). Compatible with Competitive Handles: If you want your HEINE instrument to be compatible with a competitive handle system, see the C-002.15.353 TL (twist lock). Includes: BETA 200 Streak Retinoscope Head Only.